It’s become one of the most televised international pastimes. From the World Junior Hockey Championship to the Olympics, hockey is a game played across the globe. But what is much more interesting is how hockey transcends the walls of the arenas it’s played in – how it exists away from the ice surfaces constructed specifically for it. Hockey is, in a sense, the backbone of one of the largest fast-food chains in Canada. Aside from its name, you’d never realize how connected Tim Hortons is to the worldly game. Now, it was a tweet – or rather a push for historical recognition – that inspired this look into the beginnings of this iconic Canadian coffee shop. It was one guy’s simple effort to try and reintroduce Tim Hortons’ heritage back into its storefronts. If it hadn’t been for a retweet by author Roy MacGregor, this effort may have gone unnoticed. But his request is simple. He wants to see Tim Horton’s picture back in the restaurant that uses his name – the restaurant that he was once such a big part of. And he claims he won’t give up. But 2014 is a much bigger year for Tim Horton and the buildings bearing his name. In one sense, it’s a milestone year, while also reminding the hockey world of a devastating moment. It was February 21 in 1974 when Horton was on his way home to Buffalo following a game against the Maple Leafs. Losing control of his vehicle, he flew off the Queen Elizabeth Way near St. Catherines, suffering fatal injuries. In 2005, Glen McGregor of the Ottawa Citizen revealed more details on the incident – making public Horton’s autopsy report. The report included proof that Horton not only had a blood-alcohol level nearly two times the legal limit, but that he also had Dexamyl, a barbiturate, in his system. 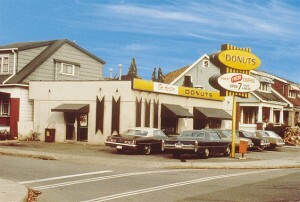 The first Tim Hortons coffee shop, located on Ottawa Street in Hamilton, Ontario. But at 44, not only was he a celebrated player in the National Hockey League, Horton had changed the coffee and donut industry north of the border. Forty years later, his name remains a household name – and not only for his play on the ice. This year also marks the 50th anniversary of the opening of the coffee shop’s first store. 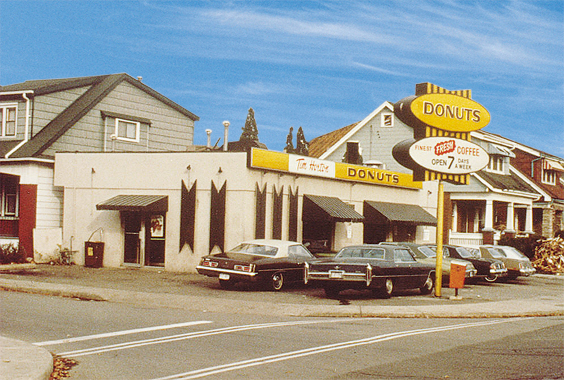 It was May 17, 1964, when Horton along with business partner Ron Joyce opened the doors to Tim Horton Doughnut Shop on Ottawa Street in Hamilton, Ontario. The brand continues to be a cornerstone for the North American coffee industry. Now, with over 4,300 stores worldwide, it’s a chain that continues to grow and a name that remains recognizable. It’s an understatement to say that Horton was a great NHL calibre defenceman. He played parts of 24 seasons with four different teams (his first two seasons only included a total of five games) – including the Pittsburgh Penguins, New York Rangers, Buffalo Sabres, and of course the Toronto Maple Leafs. 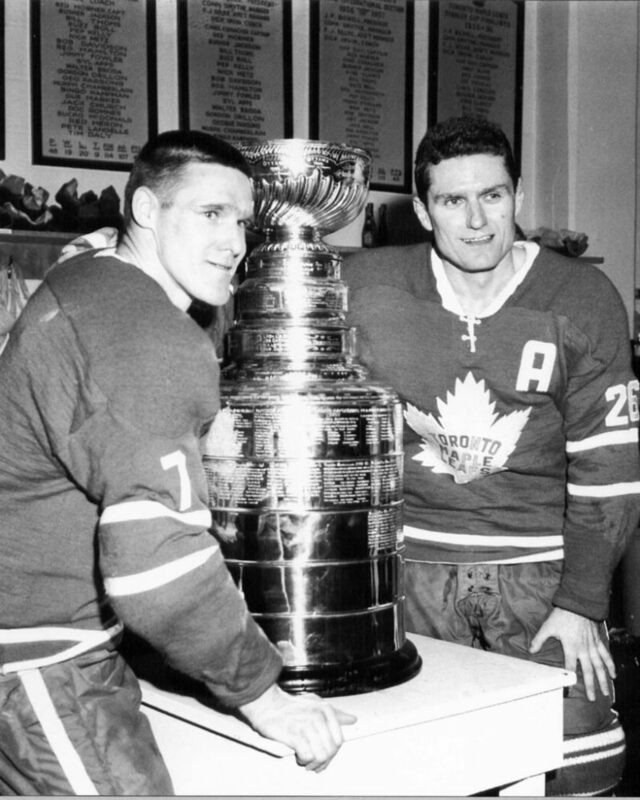 Tim Horton and teammate Allan Stanley stand next to the Stanley Cup after winning it in 1964. As a defenceman, he recorded 518 points (115g-403a) in 1,446 career games and added another 50 points (11g-39a) in 126 playoff games. He was named to the NHL all-star team six times during his career – all of them as part of the Leafs organization. He also won all four of his Stanley Cups in blue and white, including three straight from 1961-62 to 1963-64. “I think Horton, more than any other one player, was the key to those glory days,” said former coach Punch Imlach, according to the Hockey Hall of Fame’s page on the former Leaf. 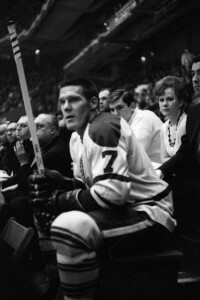 Horton wore the number seven with the Maple Leafs, switching to number two while with the Buffalo Sabres. He helped the Sabres to their first playoff appearance in 1973 which landed his number two in the Buffalo rafters in 1996 when the organization retired it. Former Maple Leafs’ defenceman Tim Horton was a six time all-star for the blue and white. Now, some may question why his number was never retired by the Leafs – having been a four-time Cup winner and a six-time all-star during his time with the team. According to John Iaboni in Leafs Game Day (Issue No. 3, 2005-06), the organization embraced a new process in which they honour players and their numbers, but only retire the numbers of those who’ve had their careers cut short and ended as a member of the Maple Leafs. In fact, many players have worn the number seven sweater since it was honoured by the Leafs November 21, 1995. At the ceremony, the Leafs named both Horton and King Clancy honoured members of the organization – both wearing the number seven. Horton was also inducted – posthumously – into the Hockey Hall of Fame in 1977. It was an honour that was truly deserved. Now, Horton’s legend lives on in the red signs of the coffee shops that bear his name, but his face remains unrecognizable to many. The company’s expanded globally to the United States as well as the United Kingdom, Ireland, and Abu Dhabi. Following Horton’s death in 1974, the Horton family was bought out of the company by his former business partner Ron Joyce. In a twist of fate, Horton’s daughter, Jeri-Lyn, married Ron Joyce Jr. reinstating the Horton name in the company’s archives. But is it time to honour the company’s heritage? Is it time to honour a legend? Sure, Horton’s ownership was dissolved in the 1974 sale, but his name remains a part of the company’s history. Is there a better way to honour a legend 40 years after his death? Maybe that Twitter user was onto something. In fact, there wouldn’t be a better time to reintroduce his picture into the, now, internationally iconic restaurant. After all, it is the coffee shop’s 50th anniversary. It would be nice to pay homage to its beginnings. For questions or comments you can follow Andrew on Twitter @AndrewGForbes or on Google+.